Our Orca watch boat trip got cancelled tonight. The orcas apparently went north out of range of our tour boat. Disappointing, but really ok. We’re on their schedule. They aren’t on ours. So, given that, and given that I’m out of internet minutes on the cruise ship but have managed to scrounge up an AT&T wireless connection for my iphone (Hey look! I can see land from here), I’m able to make another post tonight. SO .. check this out….puffins! We saw these little guys up in Sitka, mixed in with a group of murrelets and guillemots. (If I had a better connection I’d look up exact species for you) The naturalist told us that puffins are the most-photographed birds in Alaska after Bald Eagles. Am sure you can see why! 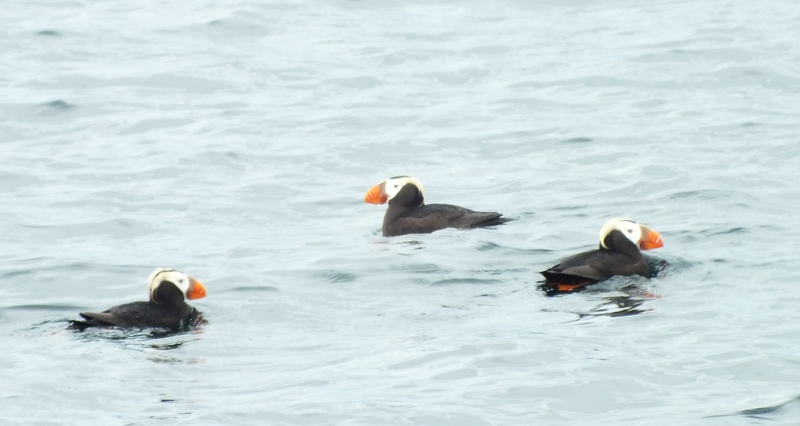 So doing a really quick online search tells me these must be Tufted Puffins (Fratercula cirrhata). Puffins are “alcids” or members of the family Alcidae. This group includes auks, auklets, murres, razorbills, and guillemots. One of the most famous alcids was the 3-foot tall Great Auk, extinct since the mid-19th century. If you feel like helping out puffins today, here’s Audubon’s Project Puffin where you can adopt a puffin and help the Atlantic species. 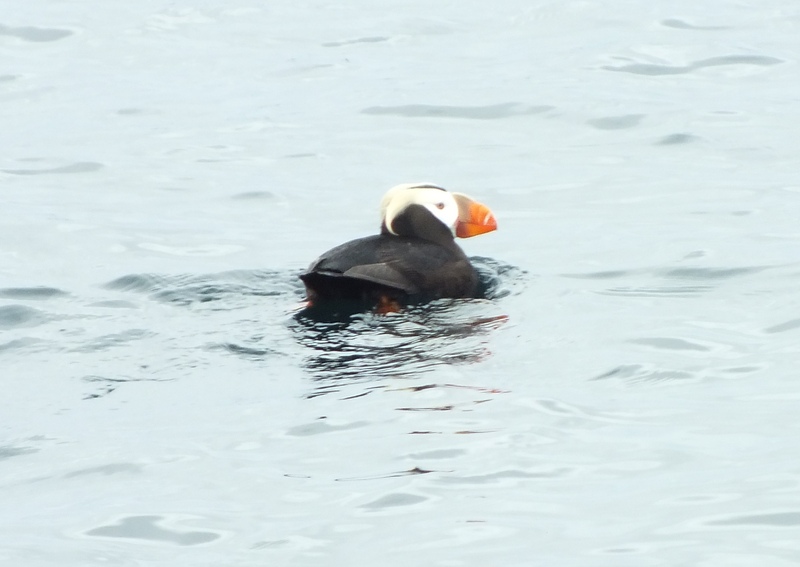 And here’s more info on the Tufted Puffin.